Mechanical brake to hold the vehicle when stationary. 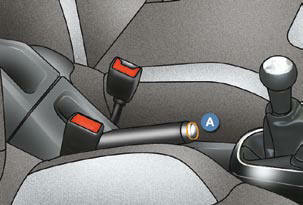 Pull the parking brake to immobilise your vehicle. Pull on the handle and press the button A to release the parking brake. When parking on a slope, direct your wheels against the pavement, pull the parking brake on and engage a gear.